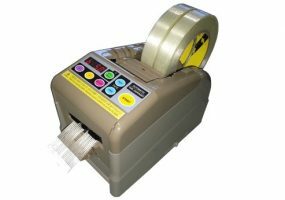 Introducing the new RT-9000F Electronic Tape Dispenser, this is the first tape cutter that can cut a variety of tapes with a folded end for applications where you need to provide an easy way to peel back the tape. This Tape Dispenser can also cut the tape without folding if required. In addition you can also set six different sequential lengths in order, which will dispense the programmed tape lengths in a cycle as either folded or unfolded. The RT-9000F Tape Cutting Machine can accept tape with a width of up to 60mm and can cut two tapes at the same time. This Electronic Tape Dispenser will cut lengths from 5mm to 999mm and has an adjustment of 1mm (with a digital setting). The RT-9000F Tape Dispenser is easy to maintain as the blade set can be changed without any tools and you can also change the PCB, rollers and gears by just removing the lid. If in doubt please send samples of your material for testing at our works. Tape Roll Diameter: 30-300mm O.D.